Some of you may remember that, once upon a time, the Wilde colony was synonymous with "the weak colony." 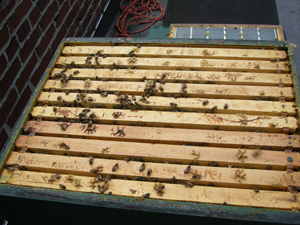 As is the way with bees, this year the Wilde bees are the biggest colony I have ever had. They are the ones on the right, with five brood boxes and three supers. I'm only slightly taller than the colony, and I can barely replace the medium boxes full of honey that sit at chest height. Folks have asked me if I am losing weight, but I think I am just getting a bit more buff from hefting it. 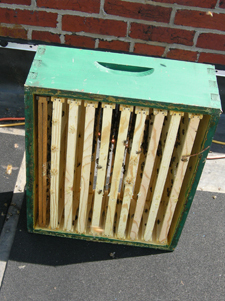 This is the Bee Cool ventilation unit, a piece of gear you will see on both roof hives. That's why my hives look like they plug in! I get a little bit of grief about this from other beekeepers, but I also get a lot more sleep during the usual span of over 100 degree F (38 degrees C) that happens every summer. This is actually not very many bees for me to find on the bottom of the inner cover. 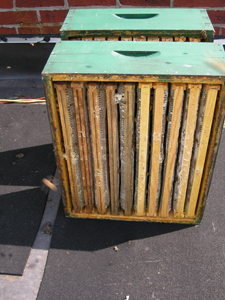 This is the top and bottom of the top honey super. As you can see, it is not that full, yet. Every time I visit this hive, I debate whether I should move this empty super down in the stack, and pile the full supers above it. 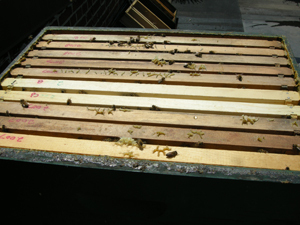 The bees are more likely to do more work, more efficiently if I move the finished product out of the way. Unfortunately, that involves me lifting two boxes weighing more than 60 pounds (25 Kg) above chest height, and stacking them carefully while trying not to squash bees. Thus far, I have have failed to find the courage. Things are less shiny and new here, and there are a few more bees. The real show is the view from the bottom, though. 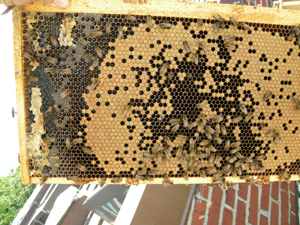 Do you see all that white comb, sticking out of both sides of each frame? Those are some fine, fat honey combs my friends. And they are a major source of my muscle definition at this time of year. Once again, the top of the super shows some action, but the bottom really tells the story. Because this hive has been a monster all year, I have been borrowing from it to help my mentees build up their hives and to even out resources with sister colonies. That's what those two bright, clean frames are about! But do you see all the wacky comb on either side? Well, that's because beespace got violated when I put such a lot of empty frame space next to mostly-drawn comb. I should not have placed them next to each other, probably. 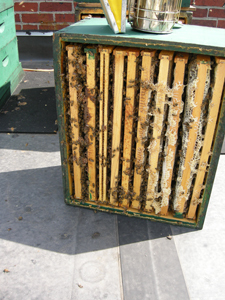 The bees decided there was a too-big gap, and they partially built comb ACROSS instead of along part of the frames. This will be hard to harvest, so I'm planning to let the girls have these frames for winter feeding. This was my first year using queen excluders, and I guess I like them. I am inherently suspicious of attempts to control the movements of the insects inside because I feel they are subject to pressures and information about which I know nothing. 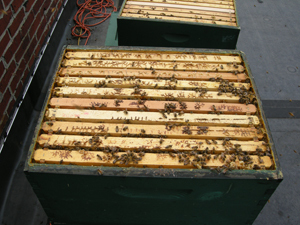 But I am only 3 boxes into an 8-box hive, and it is quite a relief not to have to search for (or worry about injuring) the queen in those top, heavy boxes. 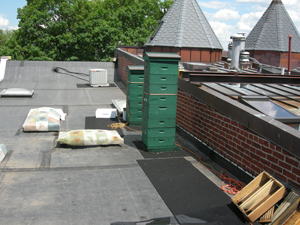 When I looked down on the brood box at right, I could see that there were not many bees, and it appears that they are beginning to fill this box with nectar and cap it. 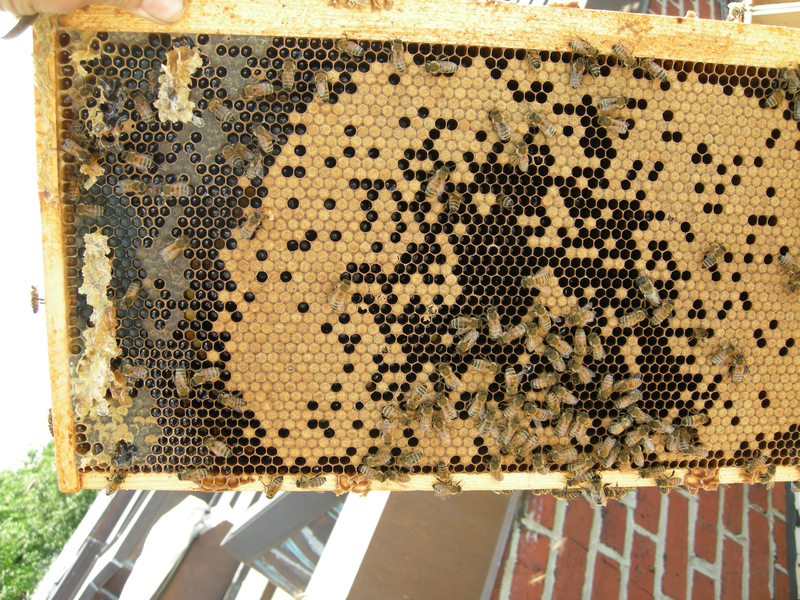 This is a sensible idea, since the brood area is now too big for one queen to fill. If they do fill this box with honey and cap it, I will move the queen excluder down one box and reserve brood box 5 (now super number 4) for winter food. 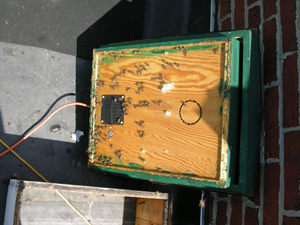 Here's brood box 4, a deep, where it finally became possible to start gathering information on hive health. 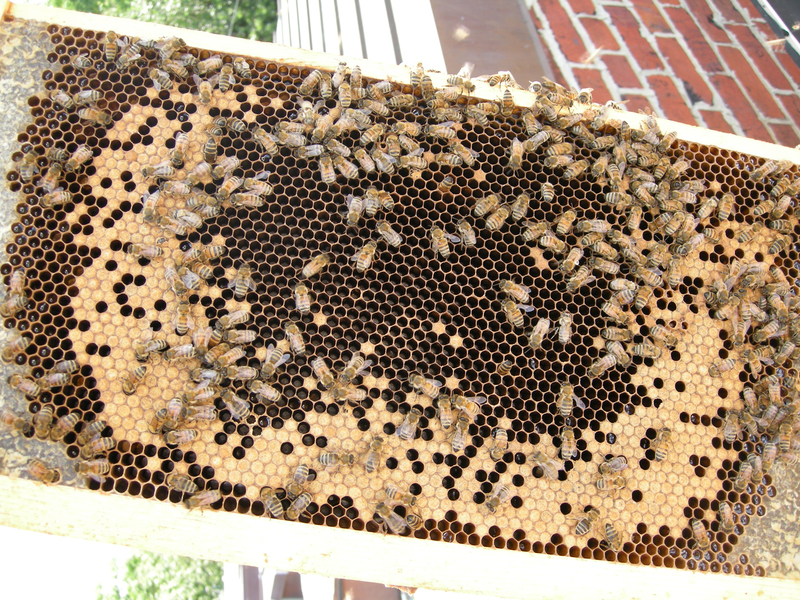 You can see lots of bees on the frames, and from below you can see brood and honey and no queen cells (yeah!) But before I set the box aside, I took a look at that brood to see all sorts of things, like how old it was, whether there were many ages of brood represented, whether they were laid in a good pattern, whether there was evidence of disease: you get the picture. Here is a frame that shows you what I have been facing for weeks now. You can actually click on these two pictures to get a closer look. Basically, I have seen very, very few eggs in any of my hives since early May, but I continue to find capped brood. 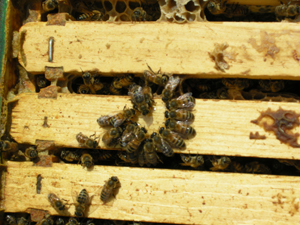 In this case, I decided that all must be well, even though I could not find brood in the center of these frames, because the laying pattern of the capped brood was so tight, the brood itself was relatively young (the caps are light, almost unsoiled wax), and the queen had so much room to lay elsewhere in the hive. It's also ALL worker brood, so the queen is laying viable eggs. Last, brood box 3. Since I have decent info, and it is getting late, I decide to end my visit. From the looks of the bees and brood I can see from the top, it looks like another pretty full box. 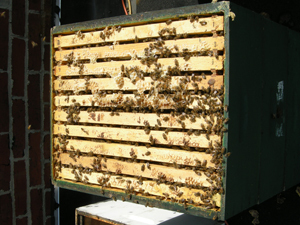 Part of the reason this colony seems to be in five brood boxes is that the queen lays in a pretty narrow chimney—maybe 4 frames in each box are brood, with a couple of the others pollen bound and the rest full of honey. 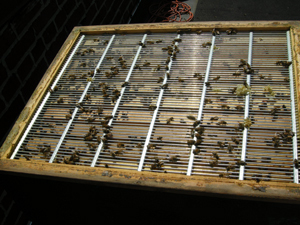 In all likelihood, there is no brood at all in the bottom box, and I should take it off, but I have no freezer space (so I can kill any wax moth eggs) and the bees will keep it safe for now. 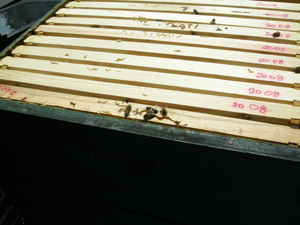 The last picture shows a circle of worker bees eating up some of the honey that dribbled from the brace comb between boxes. Once I realized that the colony was doing OK, I got happy and enjoyed some time looking at the bees, doing their bee thing. What I want to talk about, after all this hive diving, is how strength and weakness in a colony both represent a kind of extremity: in nature (which includes human nature, by the way) the closer you get to the ends of the spectrum, the more likely you are to engage in high risk/high reward strategies. Of course, the thing about risk is that while high rewards are possible, each and every win is equaled, in the end, by some kind of price tag. With bees, pursuing what seem like the laudable goal of trying to intervene to promote Ultimate Colony Strength can buy you a scramble to stay ahead of a booming colony, or to clean up the mess when you really did not know better than Mother Nature in attempting to control the outcome (even when you were only trying to make the safest possible environment for bees). How about an example of each extremity, all from just the Wilde colony? Weakness: When Wilde went queenless and developed a laying worker in 2005, I felt there was nothing to lose in trying a drastic technique. 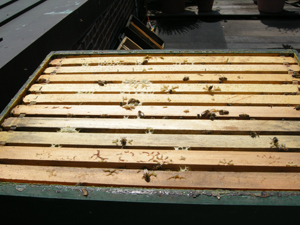 We shook the bees out all over the roof because it would supposedly keep the laying worker out for awhile when we began to introduce a new queen. The queen survived, but I have since found out that laying workers have no trouble at all returning, and that we simply got lucky on queen acceptance—maybe the colony was just too weak to fight. But I could have lost the bees I had, the bees I added, and the new queen on an unproven solution. Strength: Swarming and starving are the two great dangers of super-strong colonies, in my limited experience. Swarming is so natural to bees when families are large and strong! Knowing this, I added boxes and boxes to give them room, but I still face a situation where there may not bee enough queen pheromone to keep all these bees on the same family page, and it is enormously difficult to check on the hive. Finding the queen is basically a daydream, and the best I can do is look for evidence that she is still around. It is actually possible to have two of them in there with such a huge stack. So I basically have no idea whether the queen in there is the one I started the season with, how old she is, and therefore whether she is young enough to hold this colony together. Starving gets to be a real possibility when you bring a huge colony into the winter around here. 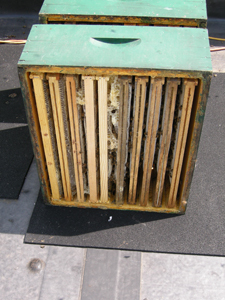 Lately we have had extended warm patches when the bees fly actively with no natural forage present. To prevent this, I face the rather radical (for me) idea of making a late summer or fall split, and going into the winter with two rather smallish colonies rather than one giant. I can try to feed like crazy instead, and that is what I will probably do: monitoring the weather really closely to try to guess how their stores are holding up, and feeding when and in the manner that the weather dictates. Now that the honey harvest is upon us, it's up to me to start making those risk versus reward calculations about hive size and volatility, and decide how much honey to take. I may be able to take as much as 200 pounds (about 80 kg) from this hive in one scenario, the equal of all my harvest from all my hives last year. But I will probably set quite allot aside as an insurance policy for my weaker hives and against a rough winter. So what do you think? 150 then?